by U.S. Agency for International Development, USAID. 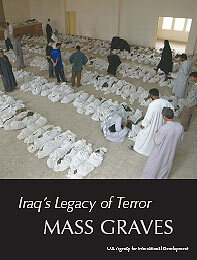 Since the Saddam Hussein regime was overthrown in May, 270 mass graves have been reported. By mid-January, 2004, the number of confirmed sites climbed to fifty-three. Some graves hold a few dozen bodies�their arms lashed together and the bullet holes in the backs of skulls testimony to their execution. Other graves go on for hundreds of meters, densely packed with thousands of bodies. "We've already discovered just so far the remains of 400,000 people in mass graves," said British Prime Minister Tony Blair on November 20 in London. The United Nations, the U.S. State Department, Amnesty International, and Human Rights Watch (HRW) all estimate that Saddam Hussein's regime murdered hundreds of thousands of innocent people. "Human Rights Watch estimates that as many as 290,000 Iraqis have been 'disappeared' by the Iraqi government over the past two decades," said the group in a statement in May. "Many of these 'disappeared' are those whose remains are now being unearthed in mass graves all over Iraq." If these numbers prove accurate, they represent a crime against humanity surpassed only by the Rwandan genocide of 1994, Pol Pot's Cambodian killing fields in the 1970s, and the Nazi Holocaust of World War II. Please note: This report contains some graphic images and descriptions, including first-hand accounts from three Iraqis who survived the mass murders.